When I first noticed this book, the Children’s Minister part of me went, “Oh boy…this would be a great addition to my library.” Every teacher has those days where they just need an easy, one-step method to getting the idea across. I’ve used children’s books for nursery, elementary and believe it or not…but even with adults. You can’t go wrong and it just brings the group together as everyone is reading the story at the same time. At first glance, you would think this is an easy-read children’s book with (you know you are thinking it) “cute, cuddly polar bears”! C’mon, how can you refuse a picture like this? Really, what you get is three stories in one book. The first is God Gave Us The World, then God Gave Us Love and finally God Gave Us Heaven. 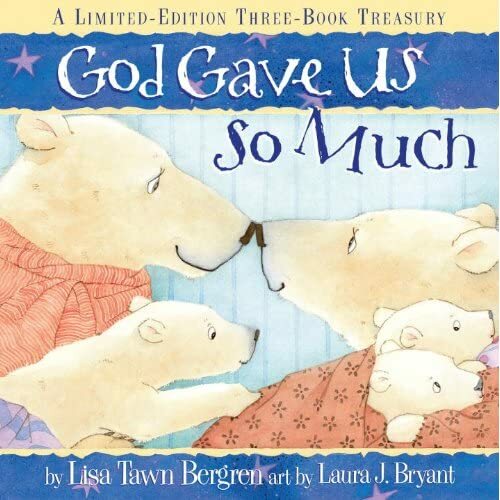 First, God Gave Us The World – the synopsis is simply the family of beats are traveling through exhibits and the younger bears are asking questions regarding why two bears are not the same. It goes above the traditional “God made the world” story as it really uses tough language and deeper thoughts to try to convey the creativeness of God. I must admit, I made it halfway through this story before almost falling asleep. Basically, I wasn’t prepared for so much back and forth dialog. I wanted a cute story and I got theological thoughts. It rubbed me the wrong way. This story is a bit long too…but the ending is solid. God Gave Us Love was deeper than one would expect, but after reading the first story, I think the reader can widen their expectations. This story I enjoyed with my three year-old son. He sat through most of the story (as expected) and he was mainly excited about the pictures, the snow and laughed when the siblings would wrestle around. You could tell that the author could have gone deeper, but refrained. I enjoyed how the various different types of love were explained in a way a child could get. In our culture today, love is usually defined in the one, easy definable way. I like how she talks about the love between parents, the love between God and His creation and the love between brother and sister. Great! This story also added a few lines I think parents will enjoy. Its those lines that make you go, “Oh yea, I’ve been there!” Well written and well illustrated story. God Gave Us Heaven really got to me. First, I believe you must be very careful and deeply Biblical when addressing the topic of heaven with kids. To be truthful, I don’t think this story did a fair job as far as the Biblical interpretation went. It talks about death, which should be a yellow caution light for many parents of younger children. Personally, if my child doesn’t grasp the idea of birth, I don’t think he will really get death. Granted, that opportunity will come and then this book may fit better. The book even suggests that you can die younger…which can really lead to deep, frighting discussion for kids not grasping the true idea of death and eternity. However, if your child is mentally ready, this would serve as a good intro for the conversation to follow. All in all, I think this book could work for the older child (elementary age or older) who is a thinker or may need some guidance in understanding a creative God, a loving God and an eternal God. Just don’t read it to your two year-old for a bedtime story!